Note, this is based on general observations of my plants and other's plants, this is just to give you an idea as to how to care for these magnificent plants. Let's start with a couple of facts about this group of closely related plants. •In the sentence above, not only where the plants listed in alphabetical order, but from the amount of care they need. •These plants are found high up in mountains in the rain forests of Queensland, Australia. With that, I'll start with care of the plants. Plants in the Queensland Sundews group like arid soils that can retain a lot of humidity and are easily penetrated by roots. -100% Peat or mixes alike. D. adelae is typically a weed and can grow in any of these mixes, they seem to turn a lovely shade of red in peat and sand, and they stay green in sphagnum. Mine are coloring up in the 1st mix mentioned above. They have a nice orange hue, but they turn deep red in peat. Light is also a factor of color, mentioned below. D. prolifera does better in the first two mixes mentioned. They tend to stay smaller and are more fragile in peat, unlike D. adelae. They seem to grow robust in sphagnum mixes. The plant seen in the picture below was transplanted into sphagnum right after the picture and flourished. D. schizandra is a very fragile plant thus I conclude it must grow in 100% Pure Live Sphagnum. I assume it would not do well at all in peat. The plants of the Queensland Group like 'wet' soil, but do not like being in deep water. They can be grown in water trays but they like to be kept moist, not wet, like Nepenthes. 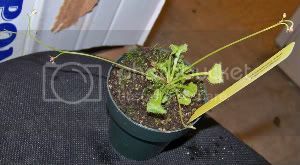 Use distilled water only, I do not recommend using tap water as the plant will burn and thus die. I keep mine in a terrarium sealed with saran rap and a fan for circulation, they grow well. The sad thing is I can't see them because the tank fogs quickly. NOTE: D. adelae is an exception, it can grow in lower humidity finely if you acclimate it first. This is the important part. Queensland Sundews grow in the shady parts of the rain forests of Queensland with Highland Nepenthes conditions. D. adelae can grow in diffused light, or direct light. It gets a lovely red hue in direct light. I do not recommend placing it in full sun as that will certainly kill it, try using a strong light* instead. D. adelae tends to etiolate if kept in low light. These plants can stand a wide variety of temperatures if acclimated. I do not recommend growing them in temperatures lower than 65F (18C). They tend to like temperatures in the 70F area (20C), but may be grown in hotter conditions. D. prolifera can grow in more shady parts, but it enjoys a grow light like it's sister(D. adelae). It enjoys a grow light* too, it can get a lovely shade of orange/yellow, like it's sister but to a lesser degree. It likes temperatures similar to it's sister, too. Around 70F(20C) would be fine. D. schizandra needs to be grown in diffused light or it will burn, also it needs temperatures a like an Intermediate Nepenthes, if it goes any higher than 85F it will most likely die on you. *-A grow light would be a lamp like an 80watt, I do not recommend putting these plants under a T5 without acclimation. D. prolifera flowering, my plant. chizandra produce new plants via roots.They come out from the sides of the plants. When a damaged leaf lands on the ground, a new plant forms at the end of the leaf. Most plants flower with red hues, or white. For these sundews, getting seed is almost impossible as most plants in cultivation are clones from a single plant, and they cannot be self pollinated. D. prolifera is cool because it makes a new plant-let at the end of each flower stalk, much like a strawberry plant. D. schizandra got named because of it's flower, since the pollen comes out from the sides of the anther. Flowers are typically small among the group, reaching up to 4mm in size. TIP:If you want big plants, grow the plants in tall pots, if you want more plants, grow them in smaller pots. Most plants do produce new plantlets over time, but if you are not patient and want new plants now, I would advise for you to take cuttings. just simply cut off some leaves and place them in either distilled water or moist sphagnum, new plants will appear over the period of a few weeks. Pot them up if you started them in water. They do well with root cuttings, leaf cuttings, and flower stalk cuttings. I would just wait, as new plants just form without you even trying. Plants of the Queensland Sundews group are closely related plants that grow well in shady and humid environs and are really good at making clones of themselves. They range from the weedy D. adelae that can grow in almost anything, to the sensitive D. schizandra that will die given improper conditions. If D. regia is considered King of Sundews, then D. schizandra should be considered Queen, because it is a magnificent plant. D. adelae is a great beginner plant that can adapt to most conditions, and is a great way to start your carnivorous plant collection. Last edited by limeslide on Wed Dec 22, 2010 10:05 pm, edited 15 times in total. I guess I'm going to be the first guy ever to kill a drosera adelae twice. The one I have now is looking pretty rough. do dorsera schizandra have 100% or any sphagnum moss in there natural habitat? kaepora gaebora wrote: do dorsera schizandra have 100% or any sphagnum moss in there natural habitat? No, they grow in a layer of dead leaves at the bottom of the Queensland rainforests. Live sphagnum mimics this. Sphagnum moss is a prefered growing medium for D. schizandra growers. I reccomend viewing this video to see what conditions D. schizandra grows in, and to see the plant in its natural environment. To add some info to Limeslide's tutorial, here's a thread with lots of info, pics (plants & flowers) & links on growing D. schizandra. While a very challenging plant, it's also very rewarding when it's happy. i transferred my Adelae from peat silica mix, to long sphag moss. in peat it always struggled, its leaves were dying about as fast as it'd grow them. i put it in sphag, and it has tripled in size within 3-4mths. it went from a small plant thats leaves were barely as long as your finger, to a plant where its leaves are so long that it'd be longer than your entire hand and fingers combined. its a truely amazing growth difference! My Drosera adelae was murdered by a catterpillar that also murdered my Nepenthes ampullaria.